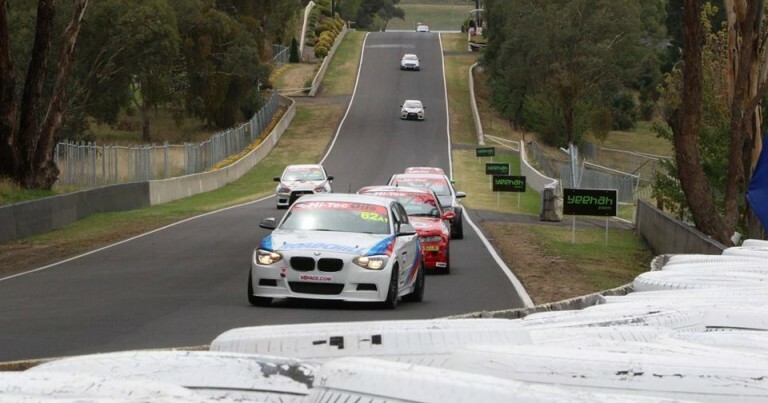 The return of a premier endurance race for Production Cars at Mount Panorama had everyone in the Production Touring Car Championship paddock excited, and a very strong contingent made the pilgrimage to the Mountain, to contest the Easter Sunday showdown. 2010 was the last time production cars were the feature act of the Bathurst 12 Hour, and after three successful years of two one-hour races for the Production Touring Car Championship at the Bathurst Motor Festival, the decision was made to reinstate a marquee event for the formula on Mount Panorama, with a six-hour race the logical choice. The event attracted interest and entries from all over Australia, with some big names entered, like David Wall and John Bowe, 2014 SuperCheap Auto 1000 winners, Chaz Mostert and Paul Morris and Australian GT competitor Nathan Morcom, as well as drivers from all forms of motorsport, like Jamie McKinlay (Sprintcars), Daniel Holihan (Formula Ford), James Duckworth (Aussie Racing Cars), and they all joined the great array of drivers assembled from both the Australian Production Car scene, and those who compete in the NSW series. Things started well for Luke Searle – he topped opening practice comfortably, but from Friday afternoon onwards, it was a nightmare weekend. The BMW pilot was due to co-drive with father-in-law, Barry Graham, but Barry fell ill on Friday afternoon, leaving Searle to draft in Paul Morris for the remainder of the event. Sadly for the BMW squad, the drama didn’t end there, as they ran into engine troubles in the Saturday morning practice session, leaving them out of Qualifying, and with a lot of work to do just to make it to the grid for the race at midday on Easter Sunday. After unsuccessfully sourcing two engines, it was third time lucky for the team, who worked through the night, and managed to have the car ready about 30 minutes prior to race start. Unfortunately, the bad luck didn’t end there, with the car successfully making it through the warm-up lap, only to come to a halt on the first run up the mountain under race conditions. The team at CXC Global Racing had a challenging weekend. The Sydney team field a three-car squad, with Bathurst local Terry Nightingale teaming up with Dylan Thomas, Daniel and Jacques Oosthuizen in the second car, while Wade Scott and Duncan Handley would team up in the #83 machine. Things went fairly well through Friday and Saturday practice, but the problems started when the Oosthuizen entry ran into engine problems in the Qualifying session. The brothers qualified inside the top twenty, but would miss the second session of qualifying as a result of those engine issues. Thomas and Nightingale qualified in sixth position, with the Scott-Handley entry to start the race from ninth. In the opening hour, Dylan Thomas made his way from 6th to 2nd in very short time, before handing the car over to Nightingale, but it wasn’t smooth sailing for the rest of the stable. The Oosthuizen entry made it to the start line, but were in the pits a very short time after, with similar issues to those that plagued them in qualifying, and sadly, they wouldn’t return to the race track – their day was done. Wade Scott and Duncan Handley ran into trouble on-track in the opening hour. The #83 had a collision with the Class A2 car of Tony Virag, Jeremy Gray and Warren Millet. The Class A2 commodore continued with minor damage, but for the team at CXC Global Racing, there was plenty of work to do, with another unscheduled pit-stop. The contact saw the Mitsubishi go up into the inside wall of Forrest’s Elbow, making heavy contact, which sent the bonnet flying into, and smashing the windscreen. The team were left to get the bonnet reconnected, and extract the front and rear windscreens before they were able to rejoin the race. The boys were the success story of CXC’s Bathurst 6 Hour campaign, coming home seventh in class, and 33rd outright. Things were going very well for the main car – Thomas and Nightingale – Thomas had moved the car forward to second, and handed over to Nightingale, who later fulfilled a life-long dream of leading laps in a feature motor race on his home track. Sadly for Nightingale, the fairy-tale would end early in the third hour, when Thomas headed for the lane unexpectedly. A problem with the valve left the engine one cylinder short, and the race was over for an entry that was, for both pace and sentimental reasons, a pre-race favourite. The success stories for the category came right across the board, with Class wins for the category in Class A2 and Class D.
After the collision with the Scott/Handley entry, things improved for Tony Virag, Jeremy Gray and Warren Millet. They had a near faultless race, and ended up winning Class A2 – finishing 6th outright, which was a superb performance. The trio finished 10 positions ahead of the next best Class A2 car, and it was an all PTC podium for Class A2, with Brett Heeley, Matthew Holt and Jamie McKinlay finishing second, ahead of Graeme Muir, Jamie Hodgson and Geoff Kite, who finished 30th outright, after running into some mechanical dramas throughout the day. Brett Heeley said prior to the event that a class podium was the goal, and they achieved that, but it wasn’t all smooth sailing. In the fifth hour, with Jamie McKinlay behind the wheel, the #47 commodore lost a wheel at Murray’s corner, sending the sprintcar racer on one of the hairiest rides of his life – a full lap of Mount Panorama, with a track full of cars, and only three wheels to do the job. He managed to get back to the lane, and after losing a few laps, they were back in the race, and heading for the chequered flag. Elsewhere in Class A2, Daniel Flanagan and Merrick Malouf had an up and down day, but still made it to the finish line in 32nd position. They were forced to start at the rear of the grid due to an infringement in qualifying, but that only made them more determined, as they charged through the field to put themselves in a very competitive position at the half-way mark – but they too ran into dramas, and spent quite a bit of time in pit-lane, before getting back out there to finish the race, some 22 laps behind the race winner. The race didn’t go to plan for Steve Hodges and Robert Coulthard, with their engine expiring in the second hour, in a big way on Conrod Straight. The oil left from that engine failure gave Terry Nightingale a hairy moment on the entrance to the chase, but it was the GWS Motorsport entry of Peter, James and Simon O’Donnell that came to grief on it. Simon O’Donnell was a passenger after running across the oil, and spun into the outside wall, with a very hard impact on the approach to the braking zone in the chase. That was one less contender in Class C for the remainder of the contest, but the series still enjoyed some success there, with Nick Cox and Adam Gosling securing second in class (11th outright), and the Bathurst team of Blake and Kyle Aubin steering their Renault Megane to third place in class, and 14th outright after six hours of racing – an exceptional performance for the inexperienced team in their mountain debut, and they were quiet achievers too, just moving along at their own pace, staying out of trouble, and taking advantage of the misfortune of those around them, in what was a race of high attrition. In Class B2, Josh Muggleton teamed up with Hong Kong based Aussie, Troy Williams. Unfortunately, they to ran into trouble, with their race not lasting the distance – they retired after completing 76 laps. Class D provided sensational entertainment across the course of six hours. When Chris Reeves spoke to Zak Sports on Thursday, he admitted that he and Mark Caine were “arrogantly” pushing for a top ten finish. Well, as it turned out, arrogance paid off for the defending NSW Champion, as he and Mark Caine not only finished tenth outright, but also won Class D.
Production Touring regulars featured prominently in Class D, and the battle for third came down to the very last lap. After six hours of racing, David Bailey and Matt Shylan got home in third, ahead of Graeme Heath, Phil Alexander and Josh Heath, by less than a second. Having a look at the outright classes – Class A1 and B1 – many were tipping a Mitsubishi Evo to win the inaugural Hi-Tec Oils Bathurst 6 Hour, given their recent dominance in the New South Wales Championship, but it was the Class B1 BMW’s that stole the show. Chaz Mostert returned to the Mountain for the first time since his very nasty crash in Qualifying for the 2015 SuperCheap Auto Bathurst 1000. When you see the name Chaz Mostert on an entry list, you automatically list the car he is driving as a serious contender for race victory, but throw in his co-driver Nathan Morcom, who has proven form in various forms of motorsport, including, most recently, the Australian GT Championship, and this was one of the strongest pairings on the grid. They claimed pole position, but started the race in 11th, after receiving a post-qualifying penalty for a technical infringement. Across six hours, the car didn’t miss a beat, the strategy was faultless, as was the driving from Mostert and Morcom, and with the retirement of the Garth Walden Class A1 Mercedes A45 AMG, the duo were at the front of the field, where they didn’t look back, nor challenged, for the rest of the afternoon. They went onto win by 2 minutes and 19 seconds from fellow Class B1 entry, David Ayres and Iain Sherrin, in their BMW 135i E82. Third in Class B1 was Bathurst local, Brett McFarland, and old HQ Holden rival, and mate, Peter Green Junior. The Subaru WRX finished 24th outright, but was on-track for a better result than that until an issue with the front right wheel saw them parked in the gravel trap at Murray’s corner late in the race. Recovery crews got the car out of the sand, and the team were able to fix the problem, and get the car back out on-track in time to take the chequered flag. The first Class A entry home was David Wall and John Bowe in third outright, and they were just ahead of Gerry Murphy and Michael Caine in the first of the Pollicina Motorsports Evo’s. There was a late race incident between the two cars. It was predicted that the Caine/Murphy entry would take third away from David Wall and John Bowe, and that brought about some very defensive driving from Wall, who was doing his best to hold on for the class win. Eventually, Caine tried to pass Wall, on the outside, on the approach to Murray’s Corner, where inevitably, disaster struck. Wall moved slightly to the right, and that resulted in massive contact between the pair, as they were passengers on a ride to the sand-trap. SOMEHOW, both drivers were able to escape, continue and finish the race, although the incident caused more damage to the Pollicina Motorsport entry, and ended their charge for the outright podium. Caine and Murphy held on in the last 25 minutes, for second in class, and fourth outright. The A1 Subaru of Adam Proctor and Mark McHenry qualified 18th, but things didn’t go to plan in the race, and they joined the growing list of retirements. Class E was won by the Nissan Pulsar of Dimitri Agathos and James Duckworth – an amazing performance, considering that car had never run at Mount Panorama prior to the event, nor done a race longer than two hours in length. The other good story to come out of Class E was the Suzuki Swift of Simon Hodges, Andrew Crawshaw and Daniel Holihan. It was the slowest car on the grid by a considerable margin, but they putted along all day long, stayed out of trouble, and finished in 29th position outright – ahead of four other cars that took the chequered flag. The team had a goal of clocking a time under the 3-minute mark, and they achieved that during the race – their best time was a 2:59.605 on lap 90. Class I, the invitational class, was an all Ford affair, with honours going to Lindsay Kearns and Coleby Cowham, who finished down in 15th outright. The 2016 Hi-Tec Oils Bathurst 6 Hour was hailed an instant success, and very quickly, is was confirmed that the event would go ahead for another three years, and within minutes of that news, the countdown was on for Easter Sunday in 2017. As always, there are winners and losers in this game, and in among the mixed bag of results for the PTC fraternity, there were some standout performance, but overall, the entire paddock can hold their head high, on what was a landmark weekend in the history of production car racing in Australia, but for now, the attention returns to the championship fight, with Round 3 coming up at Sydney Motorsport Park at the end of May.